The schematic design for a glass-clad Islamic cultural centre in New York by local architecture firm Buro Koray Duman aims to dispel fear-based attitudes towards the Islamic faith. New York-based nonprofit organisation the American Society for Muslim Advancement approached the studio in 2014, asking it to research and design a Muslim-sponsored, multi-faith community centre at an undetermined location in New York City. In the New York metropolitan area, there are 400,000 to 800,000 people who identify their religion as Islam, according to reports. The centre's aim is to promote social justice, progressive change, inter-religious coexistence and cultural exchange. "We want to promote Islam as a culture, not a religion," said firm cofounder Koray Duman, speaking on Tuesday night at a lecture at the New York Public Library. Duman, a native of Turkey, started his eponymous New York-based firm in 2013. "One of the early ideas about this building is that we really want it to be open and welcoming," he said. "We want to replace the image of Islam in the West from one of fear of the unknown to that of surprisingly pleasant." His studio's schematic design for the centre features a 100,000-square-foot (9,290 square metres) building that takes its cue from historic Islamic cultural complexes, called kulliyes. In these complexes, which are laid out horizontally, low-slung buildings with varying functions are organised around a centrally placed mosque. Given the urban context of the proposed New York centre, the firm opted to utilise the kulliye concept, but organise it vertically – so program areas are stacked on top of one another. "Since the potential site in New York City was limited, the challenge for the studio was to implement a civic experience within a vertical layout while keeping the essence of a Kulliye diagram," the architect said. 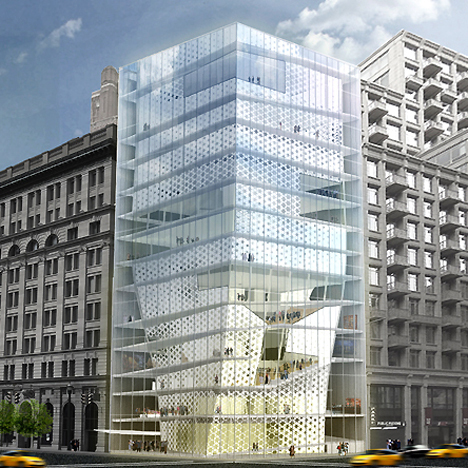 The building would consist of a rectilinear, glass-walled envelope with a tall sculptural volume at its core. The volume would be sheathed in a veil that references traditional Islamic patterns. The central space would contain an auditorium, a library, a prayer room, a restaurant, offices and other functions. Angled walkways and public spaces would wrap the central volume. "The various programs are vertically organised in relation to access," the studio said. "This distributes program vertically, with large gathering spaces near the base, public programs in the centre section, and destination spaces at the top." The prayer room and multipurpose hall are situated below the main entrance, within a double-height space that is visible from the street. "Since the prayer room must orient towards Ka'aba, the base of the inner envelope is rotated towards Mecca," the firm said. "The programme envelope twists as it moves upward to align with the Manhattan grid at the top." The transparent facade is meant to convey a sense of openness and quell a "fear of the unknown". The overall design is intended to show "a surprisingly poetic and complex reflection of history, with a look toward the future," the firm said. This is not the first attempt to build an Islamic cultural centre in Manhattan after the 9/11 terrorist attacks. In 2011, the New York architecture firm SOMA proposed a 13-storey Muslim cultural centre for a site near the World Trade Centre. The project, called Park51, incited controversy and was eventually abandoned. The developer now aims to build a luxury condo tower on the site, according to reports. Other recent projects around the globe related to Islam include a competition-winning design by Mossessian Architecture for a museum dedicated to the Islamic faith in Saudi Arabia and an Islamic centre in Toronto by Charles Correa.